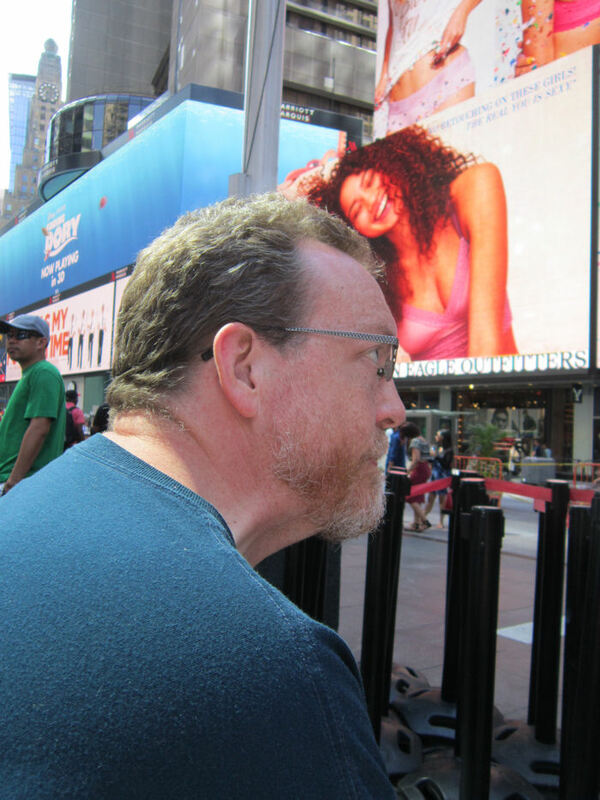 2016 NYC Trip Photos #23: Times Square for Old Times’ Sake « Midlife Crisis Crossover! 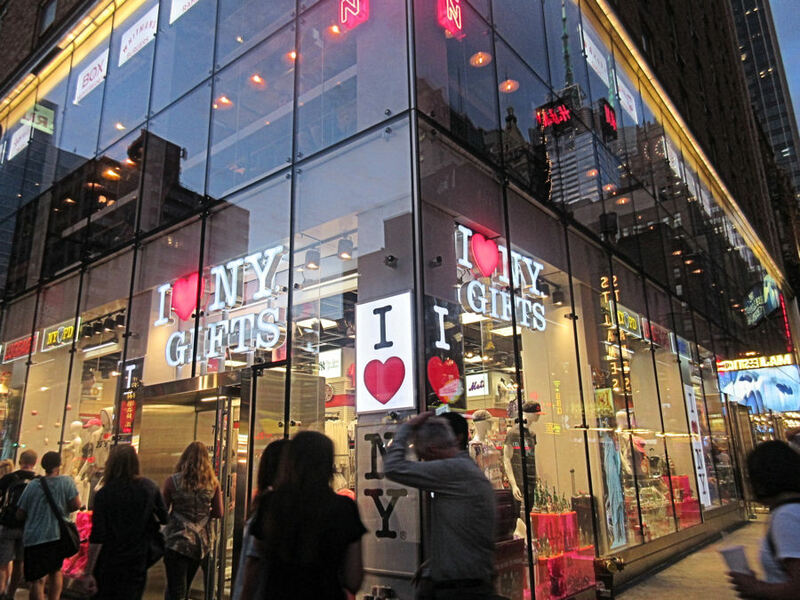 Manhattan nighttime even makes mere souvenir shopping look cooler. After our Wicked matinee and dinner, my wife and son were wiped out and done sightseeing for Day Five. 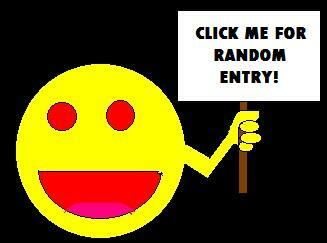 I had a bit of energy left and one more errand I wanted to run. Anne was a little uneasy letting me go traipsing alone through the streets of New York City, but I promised I wouldn’t be out all night. 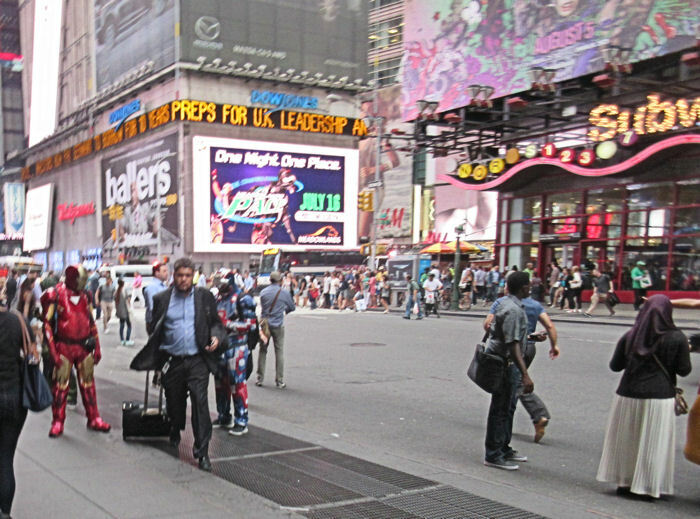 My destination was an easy half-mile walk, and gave me an excuse for one last stroll through the electric scenery of Times Square. Mind you, we weren’t done entirely with NYC yet. Day Six would once again take us far from the hotel, using the subway station at the end of our block to bypass all the usual scenery. On Day Seven our early flight out of LaGuardia left us only a limited window for photography, none of it around the hotel. 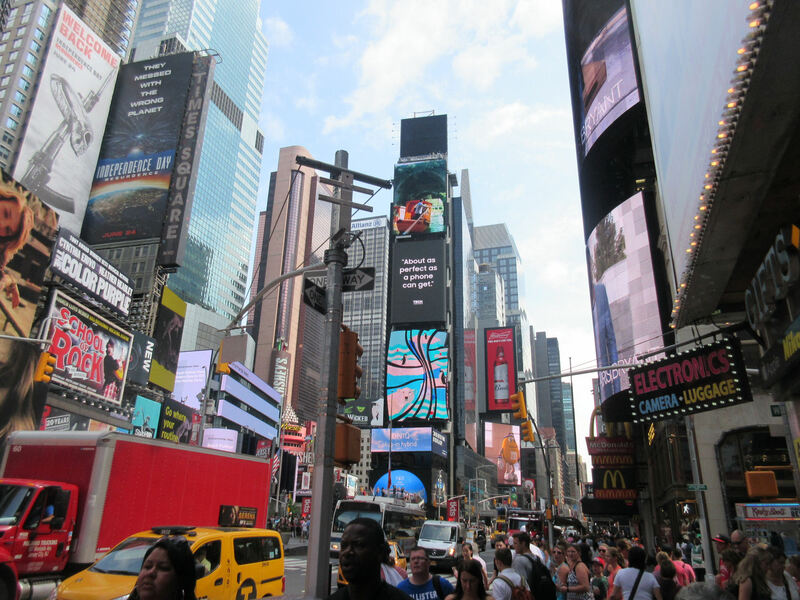 But I knew I wouldn’t have many more chances to marvel at the lights, glare at the gargantuan ads, and bask in the buzz of those busy Manhattan crowds. 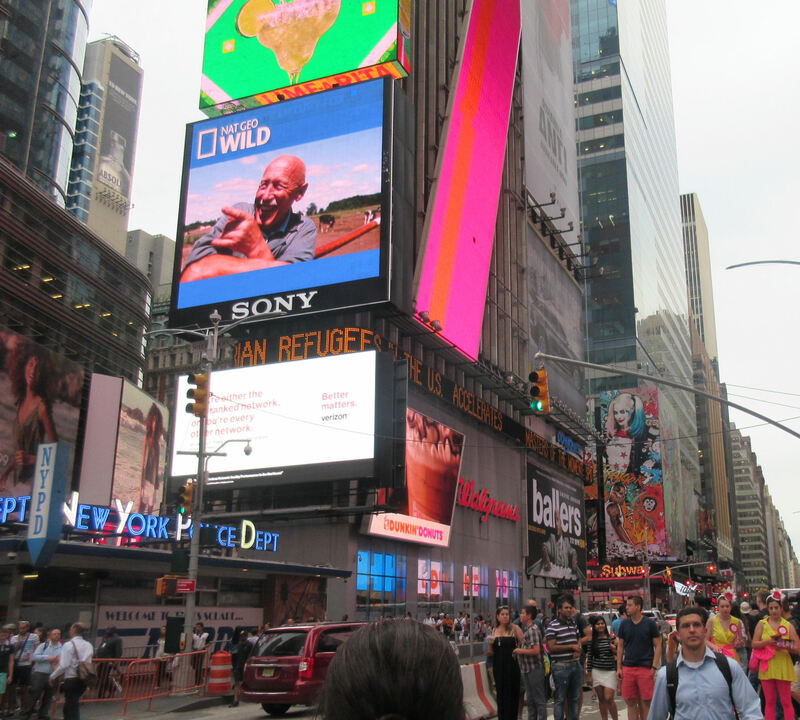 Every New York City vacation slideshow should have at least one standard-issue Times Square shot or else you’re not allowed to come back. If you don’t like the ads that showed up in your photo, wait thirty seconds and another, even less enticing product might appear. The possibility of seeing the Rockettes live at Radio City Music Hall came up early in our vacation planning, but never made it past our itinerary’s quarter-final eliminations. Maybe another time. 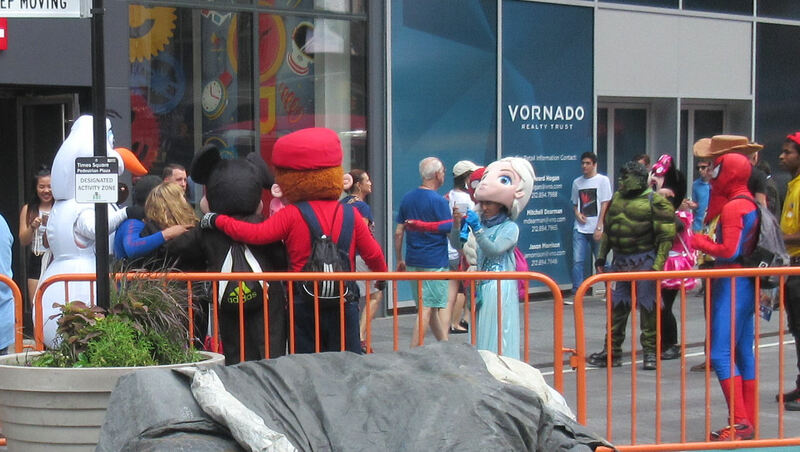 Even the cartoon mascots aren’t allowed to leave without taking pics of each other. It’s good that they’re nice to each other because I imagine their swollen heads make selfies difficult. Commuters and visitors vie for elbow room. Some stand around and gape; others have seen it all before and hurry to brush past it all. 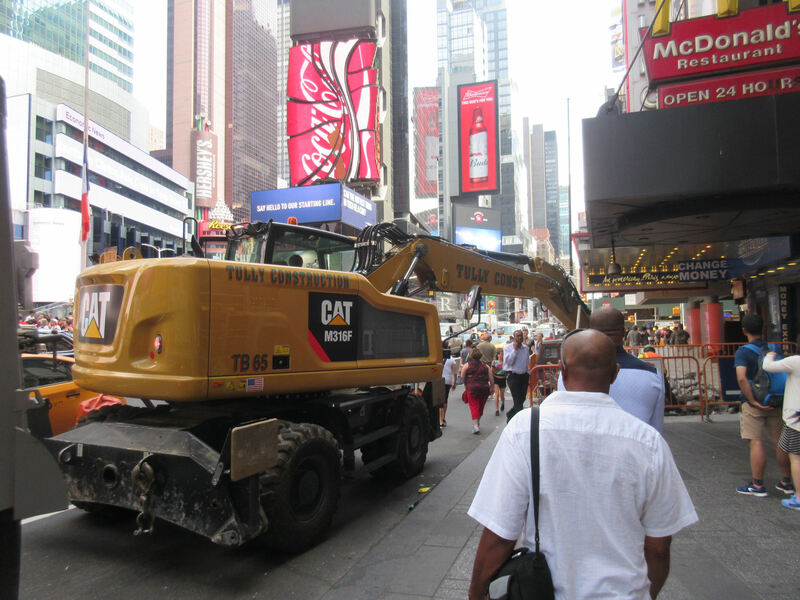 Not even the restricted streets of Times Square are immune to the ubiquitous inconvenience of road construction. With less than two days left in New York, little hints of everyday life began creeping into our vacation routine. We’d resumed checking emails and social media updates, flipping channels on the hotel TV, and missing our dog Lucky, no doubt running laps around his kennel. As for me, this was a Wednesday, and every Wednesday is New Comic Day. 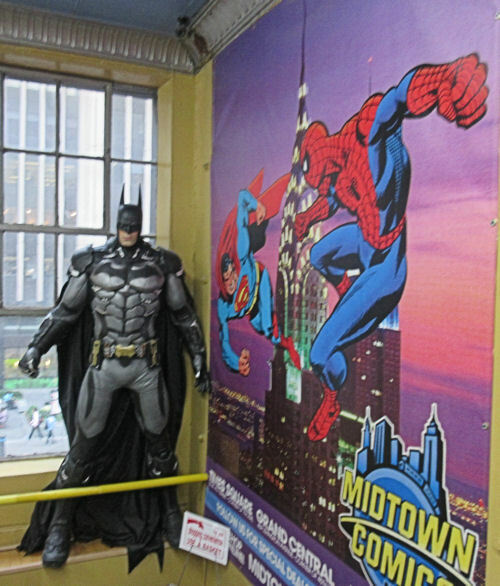 The nearest shop to our hotel was famous Midtown Comics, the same place we visited on our 2011 trip. Entrance is off 40th and 7th; head up the stairs to the second floor for the main shop; the third floor holds most of their back issues and metric tons of non-print merchandise. For the historical record, and because I still have my note to myself, my must-buys that week included Vision #9, Descender #13, Power Man & Iron Fist #6, and New Super-Man #1, one of the few DC Rebirth titles I’m touching with a ten-foot pole. From their archives I found an issue of Angel & Faith I’d missed, and was thrilled to find a copy of Evan Dorkin’s Eltingville Club hardcover that had been on my want list since before its release four months prior. 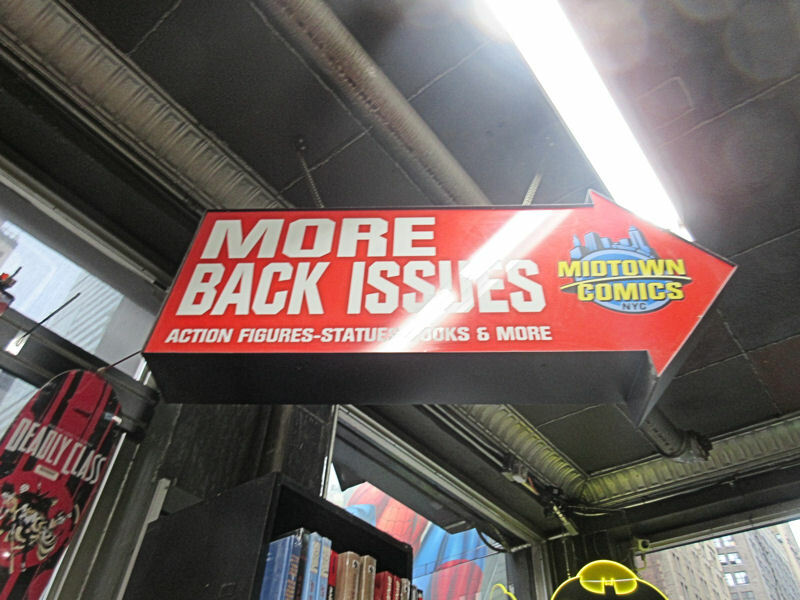 If I lived here, I’d shop here at least weekly, even though they have the longest comic shop lines I’ve ever seen since “The Death of Superman”. Curiously, I recognized my cashier as the same guy who waited on me in 2011. I debated the merits of mentioning this trivia to him, but kept quiet because I couldn’t decide if it would be too weird or too meaningless to him. I also didn’t have the heart to tell him I never did track down Brad. Regardless, he spent the intervening years becoming a published author and had copies of his most recent work on sale. That was a neat surprise. After paper-bagging my purchase, he offered me a plastic bag as well. I thought it was a kind yet redundant gesture. I figured out why when I exited the shop and walked into the first and only rainstorm of our entire week. The drops weren’t heavy, but they dogged me the entire half-mile back to the hotel. That’s what I get for daring to have my own solo adventure, I suppose. Our Hero photographed on Day Three by his wife, little realizing the ads would morph at the last second and make me look like a perv. THANKS, NEW YORK. Laughing at your last pic. Just be glad you weren’t doing jazz hands! Can’t believe you recognized the employee from 2011! !